Twitter presents one of the most unique and challenging social care opportunities. It’s real-time, fast-paced environment seems to be a go-to place for consumers to air grievances, call out for help or sing a brand’s praises—something Twitter itself has recognized. With that said, over the past few months, several B2B and B2C brands with social customer care programs have caught my eye on Twitter. Below I share some those brands and respective examples. From children’s books to groceries for tonight’s dinner menu, there’s no question that Amazon is revolutionizing the way we shop for nearly everything. So, it may not surprise you that they’ve stepped up to meet consumer demand for fast and personalized customer service on social media. In fact, like many brands are now doing, Amazon has a dedicated support account on Twitter: @AmazonHelp. But what’s really impressive is that the Twitter helpline is equipped to offer support in multiple languages including English, French, German, Portuguese and Italian. In addition, customer service agents include their initials on all communications, which adds a human element. Finally, it appears that Amazon helpers are also on the lookout for opportunities to engage with happy customers who haven’t even engaged them directly. This example is sort of a roll up of these traits. 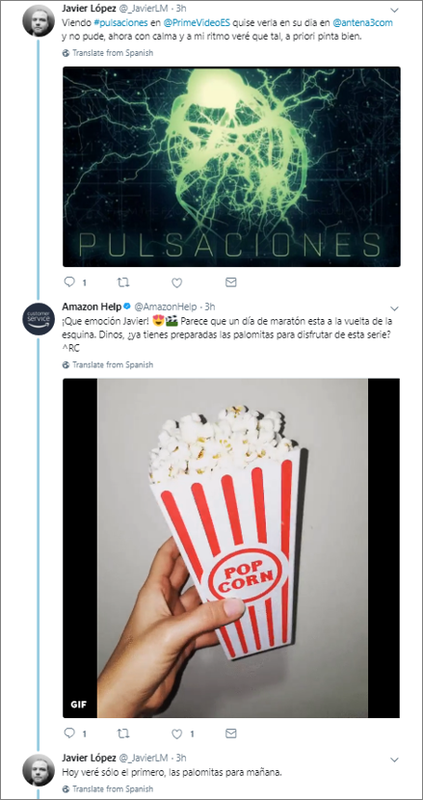 With a customer expressing his happiness for being able to watch a series on Amazon Prime, Amazon responds with a question to continue the engagement and a GIF to make a splash—and all in Spanish, with the conversation carrying on for a few tweets. To me, all this signals their deep commitment to meeting their customer’s needs and building relationships. And from a marketing perspective, this certainly strengthens the value add of their brand and reinforces loyalty. Like every courier service, UPS has an important job to do: get every package delivered to the right location, at the right time, and without any damage to the package contents. However, on a daily basis, UPS is tasked with delivering roughly 19.1 million packages and documents around the globe—so mistakes most certainly happen for one reason or another. But for anyone who’s ever been waiting on a special package, mistakes really rile us up and we don’t really care what the circumstances are. After all, couriers are in the business of delivering—so if things go wrong, we expect a quick fix. 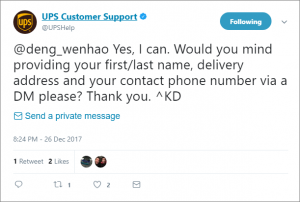 To provide that fast service and meet their customers where they’re comfortable, UPS has established a customer service Twitter account: @UPSHelp. What stood out to me, is that UPS utilizes Twitter’s private messaging feature. To resolve any issue, UPS needs the tracking numbers for the packages involved, which is private customer information. So, more often than not, you’ll notice a “Send a private message” option at the end of a tweet. 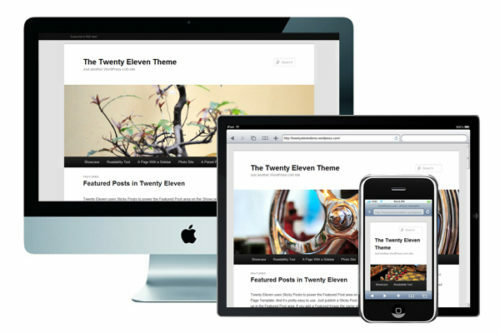 This makes it easy for customers to take the next step to get their gripe resolved and protect their information. While any organization engaging in social care is bound to field customer complaints, sometimes providing a great social care is answering simple questions and real-time troubleshooting. 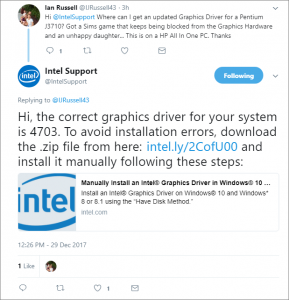 Intel is a great example of a brand delivering precise recommendations and resources to help their customers troubleshoot a range of issues. In addition, like UPS, Intel also leverages the “Send a private message” feature when appropriate to take a public conversation private. 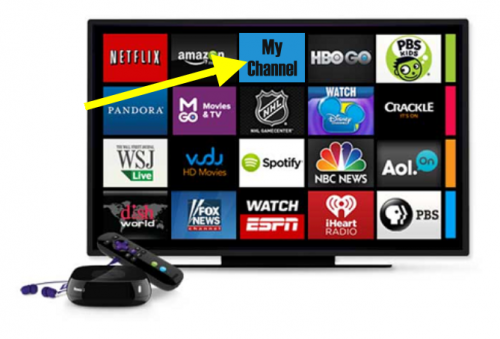 In the example below, Intel gives this customer everything he needs to solve his issue. Constant Contact has built its business on helping their customers communicate effectively with their respective audiences. So, it’s only right that they’d make easy and fast communication a priority by engaging in social care. 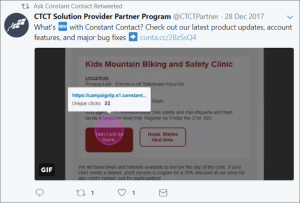 Like others on our list, Constant Contact has a dedicated customer service account on Twitter: @CTCTHelp. What I found interesting here is the proactive communication that’s happening. Customer service reps aren’t just responding to inquiries and complaints, but also sharing important information and reminders—from holiday best wishes and grammar tips to links to the latest product updates and bug fixes. After nearly 50 years in business and with thousands of stores worldwide, there’s no question that Starbucks has cultivated a massive and loyal following of coffee fanatics around the globe. But while the deep brand affinity Starbucks has built is a testament to their product and service, like any business, fans can be just as easily dismayed as overjoyed. 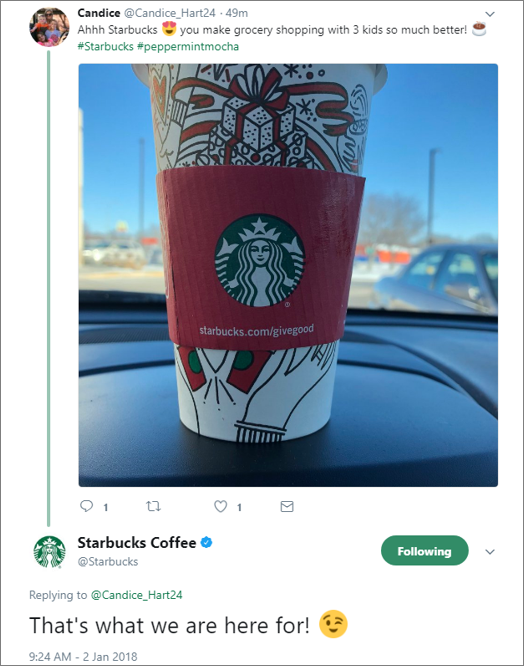 So—from a customer lamenting the end of a seasonal drink’s annual run and bad service experiences to a happy customer indulging in her first Peppermint Mocha of 2018—Starbucks embraces all feedback and makes it a point to respond to (apparently) every engagement with the brand on Twitter. To really drive it home, Starbucks appears to be continually monitoring related hashtags and even non-tagged mentions of the brand, to level up its “we’re here for you” persona in real life and on Twitter. The award for calming, empathetic and personalized social care goes to Buffer. Whether someone is throwing out an idea for improving the platform or experiencing a performance issue, Buffer helpers make a serious effort to let folks know they understand their frustration, are there to help and can work to find a solution. Also, whoever is responding to a request or complaint always signs their full name within the Tweet, adding an extra human touch and level of transparency. Below is a great example. 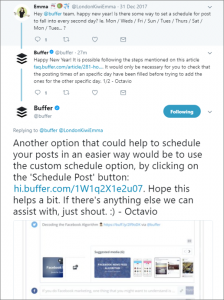 The user is asking for some scheduling information guidance, and Buffer’s Octavio delivers with a detailed, personalized and upbeat response. There may be no better endorsement of the importance and benefit of embracing customer service on Twitter than other social networks taking part in it all. Such is the case with LinkedIn. Through its dedicated @LinkedInHelp account, the LinkedIn Customer Service team is standing at the ready to offer guidance and help troubleshoot issues. 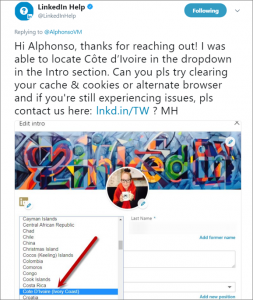 As with others mentioned in this post, LinkedIn helpers provide personalized responses to users, signing each message with initials or a full name. While the example below is a simple and easily remedied issue, the service rep attached a screenshot to make it easy for the user to find the menu item they’re looking for, but also added additional troubleshooting instructions just in case. While most social customer care programs are likely administered by a brand’s customer service team, the marketing department can and should be a dedicated partner. At the end of the day, more and more people are using Twitter and other social media sites to share their brand experiences—and those experiences not only have the potential to impact a brand’s identity, but they’re also gold mines for marketing insights. The bottom line? If your brand isn’t on the path to providing social customer care, now is the time to consider making moves. As social media becomes increasingly embedded in our daily lives and culture, brands have the opportunity to use social care as a marketing advantage and relationship building tool. What brands have caught your eye on Twitter for their social care efforts? Tell us in the comments section below. 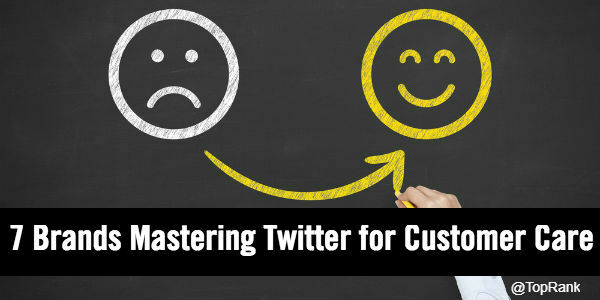 The post 7 Examples of Brands Leveraging Twitter for Social Customer Care appeared first on Online Marketing Blog – TopRank®.